“The project will be implemented under full grant assistance of the Government of India with an estimated outlay of Sri Lankan Rs. 192 million (US$ 1.7 million). The completion of the project is expected to provide a boost to economic activities in the Jaffna Peninsula and generate local employment, both direct and indirect, for about 2,000 people. It is also expected to lead to flow of significant investments to increase production capacities in the sectors of textiles, plastic and leather products, food processing, agro-based industries, oil and fibre products, etc., thereby resulting in better utilisation of local resources. An event to lay foundation stones for three factories in the Atchuveli Industrial Zone was held on 16th April 2014. 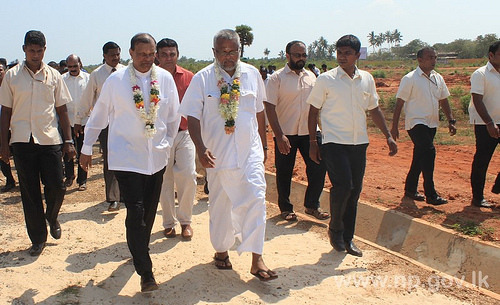 Minister of Traditional Industries and Small Enterprise Development Douglas Devananda and Governor of the Northern Province GA Chandrasiri participated as chief guests and laid down the stones. Indian Consul General, Jaffna V.Mahalingam also participated at this event. 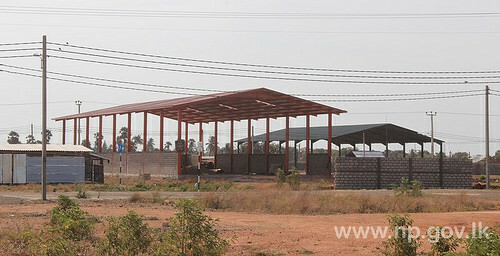 A plastic pipe factory, a fishing net factory and a factory of Hemas are to be constructed in the zone. This industrial zone is being established with the 225 million rupees financial support of Indian Government and 50 million rupees financial support of Sri Lankan Government. This project is expected generate many job opportunities which will benefit the local residents at various categories. Self-Employment Batik Training Project for Women in Jaffna was commenced in Chankanai on 15th March 2014. Minister of Traditional Industries and Small Enterprise Development Douglas Devananda and Governor of the Northern Province GA Chandrasiri participated as chief guest and officially inaugurated the project. Ministry of Traditional Industries and Small Enterprise Development, National Craft Council and Rotary Club jointly organized this project at a cost of 3 million rupees.